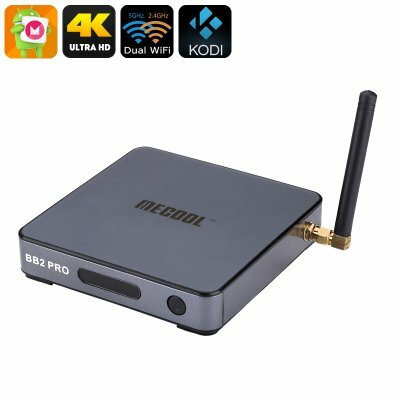 Successfully Added MECOOL BB2 PRO Android TV Box - Android 6.0, 4K Support, Miracast, Airplay, Octa-Core CPU, 3GB RAM, Google Play, Kodi TV to your Shopping Cart. The MECOOL BB2 PRO TV box is the ultimate home entertainment system that is guaranteed to bring along countless hours worth of joy and entertainment to be enjoyed by you along with all your friends and family. Running on an Android 6.0 operating system, this media hub delivers a smooth and speedy performance that comes packed with the latest applications and features the industry has to offer. Whether you like to enjoy your favorite mobile applications on a large screen TV, play online games, browse the web, or watch your favorite movies in stunning detail – with this Android 6.0 TV box your options will be limitless. Supporting 4K resolution, this 4K TV box lets you enjoy your favorite media in absolutely stunning ultra-HD resolution – providing you with a truly cinematic experience from the comfort of your own living room. From now on you’ll be able to enjoy the latest movies and most popular series in mesmerizing resolution, astonishing detail, and vivid color as this Android TV box is guaranteed to bring your media experience to the next level. Additionally, this Android 6.0 TV box also supports Miracast and Airplay – allowing you to mirror all that’s happening on your smartphone or tablet onto your big screen TV without the need of any cables. No matter whether you’re using an Android or Apple device, with this 4K TV box you’ll be able to enjoy all your phone’s features on your big screen TV and this take the most out of your TV and smartphone alike. Featuring a powerful Octa-Core CPU, this Android TV box is not only capable of playing the latest 4K movies but also allows you to play demanding online games and use the latest mobile applications without dropping a frame. Built for speed, this 1.5GHz GPU lets you launch the heaviest and most demanding of applications in a split second and allows you to enjoy them to their absolute most. Additionally, this 4K TV box packs a stunning 3GB of RAM, letting you engage in the heaviest of multitasking sessions out there without you ever needing to worry about slowing down your device. No matter what you throw at it – this Android TV box is guaranteed to handle it at ease. With 16GB of internal memory and the added possibility to throw in 32GB of external storage, this Android 6.0 TV box holds enough storage for you to keep all your favorite media and games alike – ensuring that from now on there will never again be a single moment of boredom within your household. The MECOOL BB2 PRO TV box supports Dual-Band Wi-Fi, letting you enjoy the fastest data speeds out there. Browse the web, download media at lightning speeds, and stream online movies in the blink of an eye – thanks to the ultra-fast internet connectivity this Android TV supports a laggy connection will be an issue of the past. So head out to the play store and download the latest games and applications or use Kodi 17 to get access to tons of the latest movies – this Android media hub is guaranteed to turn your TV into a state of the art smart TV that comes packed with an unlimited amount of fun and mobile entertainment for you to enjoy for years to come. The MECOOL BB2 PRO TV box comes with a 12 months warranty, brought to you by the leader in Android TV boxes as well as wholesale electronic gadgets..